Your infrastructure is unique—your migration path to higher speeds must be as well. At CommScope, we get it. That’s why we developed the High Speed Migration platform. Designed using modular, high-speed components, the High Speed Migration platform supports multiple generations of equipment while keeping your infrastructure agile, scalable and manageable. Expand when and where you need without overspending or overprovisioning. And with CommScope’s Application Assurance, you can know there will be long-term support for your ongoing evolution to higher speeds and emerging applications—without having to rip and replace. 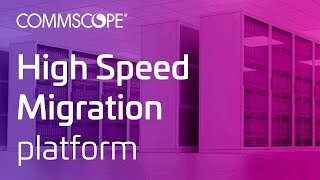 The High Speed Migration platform is just one more way CommScope is helping shape the always-on networks of tomorrow. To see how we can make it work for you, visit the links below to view our customer-specific pages. Together, we make the future possible. Wanting to learn more about High Speed Migration? Learn more about how our High Speed Migration platform enables your infrastructure to adapt, evolve and scale now and down the road. Shifting architecture, increasing lane speeds, impossible demands for latency. Staying ahead means keeping informed. Data center networks a la "mode"
Infrastructure Migration: If Not Now, When?